What does Postural Reconstruction® do? seeks to release excessive muscle tone in the body which is the source of postural distortion. improving alignment and relieving musculoskeletal complaints. rebalances muscle tonicity, thereby restoring the body’s ideal form, decreasing pain and optimizing function. What is a Postural Reconstruction® evaluation? the physiotherapist will perform a postural assessment specific to Postural Reconstruction®. the evaluation enables the development of a therapeutic strategy as a function of the muscular tensions and postural distortions observed. What does a Postural Reconstruction® treatment involve? Treatment consists of individual, sixty–minute sessions. The client executes specific breathing and performs precise maneuvers designed to release the excessive muscular tone. Initially treatments are scheduled weekly. As symptoms improve, the sessions may be reduced to biweekly or monthly. As the condition further stabilizes, maintenance treatments may be provided according to the patient’s individual needs. In general, an initial series of twelve treatments is necessary to obtain lasting results. The client’s complete compliance and active participation are essential to each therapeutic session. What can Postural Reconstruction® do for you? What to Expect from Postural Reconstruction Physiotherapy? Postural Reconstruction® Physiotherapy works to normalize the tension in the muscles of the entire body. Improved posture, fewer symptoms, increased energy and greater ease with everyday activities like walking, work, exercise, household chores and specific sports are all possible results of Postural Reconstruction® Physiotherapy. On your first visit to the Postural Reconstruction® Physiotherapist, she will take the history of your current complaints in addition to any previous accidents and traumas. The Physiotherapist will do a standing postural assessment to determine the shape of your body with special emphasis on your back, rib cage, hips and pelvis and to note areas of unbalanced muscle tension. The evaluation is continued on a mat on the floor in which you hold specific postures that cause other parts of your body to compensate. The Physiotherapist is learning how your body works with its areas of tight muscle and postural distortions. You will be wearing your undergarments for all the treatments. Postural Reconstruction® Physiotherapy treatment involves holding specific postures to the point of neuromuscular fatigue while lying on your back, sitting or standing. You will be asked to breathe in a special way to enable release of muscular tension. It is important to continue the special breathing during your entire session as talking, moving around or falling asleep are interruptions that decrease the effectiveness of the treatment. The Physiotherapist is constantly evaluating your response to the postures by hands-on techniques and careful visual observation aided by mirrors on the walls. Often photographs are taken as way of recording and evaluating postural changes over many sessions. For more information, please visit www.reconstruction-posturale.com. Accompanying the release of muscular tension, people occasionally experience an emotional release in the form of laughing, crying, sadness, memories, shaking or feelings of warmth and peace. This may be part of your healing process. 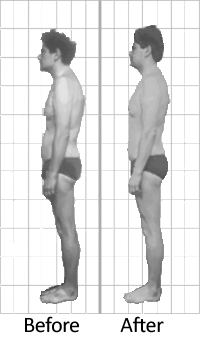 After the treatment, the Physiotherapist will re-evaluate the standing posture to note changes in your body. Ideally, it is best to follow the treatment with a walk and to take it easy for the rest of the day. Responses to treatment are variable – some people are energized while others are exhausted. It is O.K. to feel an increase in your usual pain or an odd pain during the first 48 hours as you have just worked your muscles to the point of fatigue. If you acquire a new pain or your symptoms are aggravated for longer than three days, discuss this with your Physiotherapist. Each treatment is once a week for one hour with a one to one therapist to client ratio. The frequency may decrease as your symptoms improve. A typical series of treatments is 12 visits, although obviously due to individual variation, people can require more or less than 12. The cost of each treatment is $145.00 (student and seniors rate is $120.00 per session). Although Postural Reconstruction® Physiotherapy is not covered by the Calgary Regional Health Authority, many supplemental health insurance plans cover Physiotherapy. Please call to book now or book online! Developed in the late ’70s by French osteopath Paul Chauffour, Mechanical Link is a gentle manual therapy that encourages the balance of tensions in the fascial system – that complex web of tissue that interconnects and affects all other body systems. It spreads throughout the body uninterrupted, providing physical stability while also allowing flexibility and mobility. Think of the fascial network as a spider web. Imagine what happens if one area of the web is pinched or tightened: everything else distorts. The body compensates for physiological or traumatic stress in much the same way – by producing patterns of tension called lesions that affect the entire structure. These patterns are intended to relieve pain and disability and protect the body from further stresses. Yet the long-term effects of such compensation can prove debilitating. Mechanical Link therapy is guided by the body’s own wisdom about its unique needs. The work stimulates to the body’s self-corrective responses, promoting normal mobility, tissue tone and posture. Mechanical Link brings tension into equilibrium and allows the body to return to optimal functioning ability, so all its systems can improve – including the immune system.